Sneak out of work a little early and get a table at one of these 12 places where summer living is easy and the beer is $5 (or $4). This rooftop patio on 17th Avenue S.W. serves $5 draft beer, high balls and wine. You can also get half price appetizers. Aejo celebrates halfy hour with half price tacos and tequila everyday. You can also get $6 margaritas and beer. This Calgary mainstay has a big, covered patio that stays open into the cooler months. There are more than 300 beers on the menu and all day on Sundays, all local draft beers are $5. Caesars and wine by the glass are also $5. Cibo’s 17th Avenue S.W. location does $5 pizza and $4 wine and beer. The patio is sunny but secluded behind a street-facing wall so it’s a cozy (and cheap) date-night spot. Cleaver’s happy hour covers a lot of hours. Before 7 p.m. and after 9 p.m. from Sunday through Thursday, you can get $3.50 sliders and $7 wine, beer and cocktails. Cleaver’s Latin sister restaurant and next-door neighbour has the same happy hour hours but does $3 tacos and $5.50 cocktails. Home and Away’s happy hour gets you beer, wine and well drinks for just $4 on weekdays from 3 to 6 p.m. and all day on Sundays. Sunday Funday, anyone? This patio is right downtown and in close proximity to a lot of people looking for an afternoon drink. For happy hour, sparkling wines are 40 percent off, feature cocktails are 50 percent off, draft beer is $5, highballs are $5.25, and featured red and white wine is $8 a glass. Highlights from the food menu include cheese toast ($5.95), a prime beef burger ($14.95) and oysters ($1.50 each). The Living Room’s happy hour is pretty straight forward. All wine and small plates are half price and there’s also a $5 feature beer and cocktail. Western Canada’s biggest rooftop patio has a happy hour that includes beers for 25 cents an ounce ($5 for 20 ounces and $3.50 for 14 ounces) and oysters for $1.50 each. This is a prime patio in Calgary, tucked into a shady corner of Central Memorial Park. 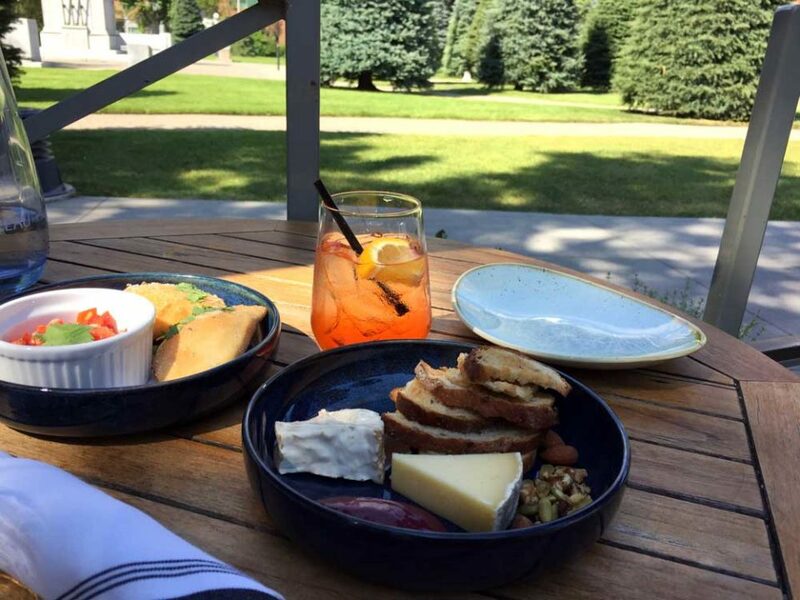 Its happy hour menu includes Aperol spritzes for $5 and a featured red and white wine for $7 a glass. When: Weekdays 4 to 7 p.m., Saturday 6 to 8 p.m. and Sunday 3 to 6 p.m.
Calgary’s favourite, always-busy patio has daily happy hour deals. There’s discounted draft beer and tall boys (prices vary) and highballs for $4.05. What’s better than happy hour on a patio? Happy hour on a patio with your dog. At Vin Room’s 85th street patio and on the front patio at its 4th Street location, your furry friend can join you for $7 glasses of wine and $5 tapas. This article was last updated July 12, 2018.